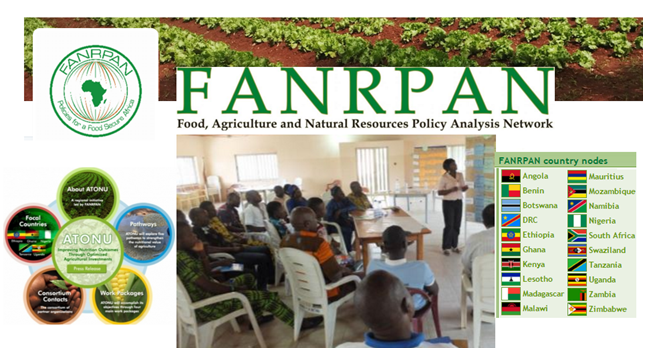 The Food, Agriculture and Natural Resources Policy Analysis Network (FANRPAN) is a multi-stakeholder, multi-national policy network that supports the development and implementation of better food, agriculture and national resources (FANR) policies in Africa. The Food, Agriculture and Natural Resources Policy Analysis Network (FANRPAN) was established in 1994, when the Ministers of Agriculture from Eastern and Southern Africa saw the need for an independent policy input to address chronic food insecurity and the challenges of managing natural resources. In 2003 FANRPAN was officially registered as a private voluntary organization (PVO) in Zimbabwe, although it has since moved its regional secretariat office to Pretoria, South Africa where it operates as a fully-fledged international office with diplomatic status. Since 2005, FANRPAN has pioneered regional learning and knowledge sharing and acquisition in agricultural and food security policy analysis and advocacy, as well as research and formulation of priority Africa agricultural research themes, initially in Southern and Eastern Africa, and latterly extending its contribution and reach to continental and global levels. FANRPAN achieves this through facilitating linkages and partnerships between government and civil society, building the capacity for policy analysis and policy dialogue in Africa and supporting demand-driven policy research and analysis. 3. supporting demand-driven policy research and analysis. promotion of sustainable agricultural development in Africa. In February 2016 FANRPAN has been ranked 13 out of 92 in Sub-Saharan Africa and 55 out of 175 globally in the 2015 Global Go To Think Tank Index Report (TTI), led by the University of Pennsylvania through its Think Tanks and Civil Societies Program (TTCSP). FANRPAN - as a member of the Global Alliance on Climate Smart Agriculture (GACSA) - is conducting Climate-Smart Agriculture (CSA) case studies in Tanzania and Malawi under a broader project on Perspectives on Climate-Smart Agriculture from Across the Globe: Climate-smart Case Studies. All reviewers will be appropriately acknowledged in the final case study report that will be published by the GACSA coordinating unit at FAO. In December 2015, FANRPAN – together with CGIAR Research Program on Climate Change, Agriculture and Food Security (CCAFS), Technical Centre for Agricultural and Rural Cooperation (CTA), Climate and Development Knowledge Network (CDKN) – presented its ideas and work in progress at the side event: From farmers’ fields to landscapes: Food security in a new climate regime? and during other sections of the Global Landscapes Forum: Launching the new climate and development agenda. At the 6th Africa Day for Food and Nutrition Security (28 October, 2015, Kampala, Uganda), FANRPAN and Consortium partners announced its new regional initiative Agriculture to Nutrition (ATONU) which focuses on how agricultural programs can improve nutrition outcomes through optimized agricultural investments. Other projects with participation of FANRPAN could be viewed here. Different resources types – such as Annual Reports, Events, Newsletters, Policy Briefs, Press Releases, Reports, Resources, Video, Workshop Reports – produced by FANRPAN could be viewed here.